Talking Stick is one of the hottest hotel properties in the Valley of the Sun, built by the Salt River Pima-Maricopa Indian Community. The casino is a destination for both locals and visitors every day, all year long. When big-name performers come to town, and you want to see them in a modern, comfortable and more intimate setting than an arena or stadium, the Showroom is the place! Larger audiences will experience shows in the Ballroom. For a special dinner with extraordinary Valley views, Orange Sky is on the 15th Floor of the hotel. Talking Stick Resort is right across the highway from Salt River Fields, the Spring Training Baseball home of the Arizona Diamondbacks and the Colorado Rockies. In the summer, check out the free Arizona Rookie League baseball games. The Scottsdale Scorpions of the Arizona Fall League also play there. Talking Stick Resort is just east of the Loop 101 Pima Freeway at Indian Bend Road/Talking Stick Way in Scottsdale. When exiting the Loop 101, head east toward the resort. Bigger name performers usually perform at the Salt River Grand Ballroom to afford the opportunity for a larger audience, up to 1,600 seats. In the Grand Ballroom seating is all auditorium-style. From the side sections views of the stage may be limited, though video screens are provided. In the Ballroom, the stage is elevated, so most people of average height should have a good view. Smoking is not permitted. The Showroom is a more intimate venue with about 650 seats, making it a great place to see a concert. At the Showroom, all seats are good seats. The upper level is graduated, stadium-style. There is bar seating, cocktail type seating, and regular auditorium-style seating for most shows. The Showroom doubles as a dance club when no shows are being presented there. Smoking is not permitted. The Pool area at Talking Stick Resort becomes an outdoor concert venue during the months of moderate weather in Scottsdale. Instead of seats, this venue has pool chairs and chaise lounges, plenty of standing room, and cabanas available to rent. Smoking is permitted here since it is all outdoors, but swimming is not. If you are staying at the Resort, make sure you check out which rooms have a view of the concert area. I hear that the suites on the second floor facing east are the prime locations! Note: There is also a Showroom at Casino Arizona, owned and operated by the same group, so the websites are inter-related. However, The Showroom at Casino Arizona is a different venue altogether, and is not located at Talking Stick Resort. 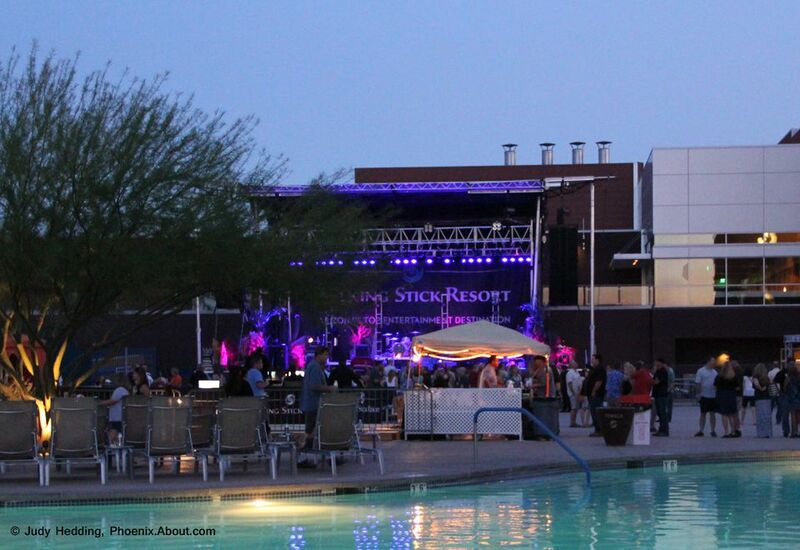 All guests at Talking Stick Showroom, Talking Stick Grand Ballroom, and at Poolside concerts must be 21 or older. You can purchase tickets for the concerts and performances in person at the box office or online through Ticketmaster. If you are interested in making a full day of your trip to Talking Stick, you can hit up the casino or enjoy a round of golf at the Talking Stick Golf Club, see a Spring Training baseball game, do some shopping at the Pavilions, or attend one of several festivals held at Salt River Fields on the other side of the highway. Arizona Cocktail Week: Just Plain Intoxicating! Nothing to Do in Scottsdale? Go to the Movies!